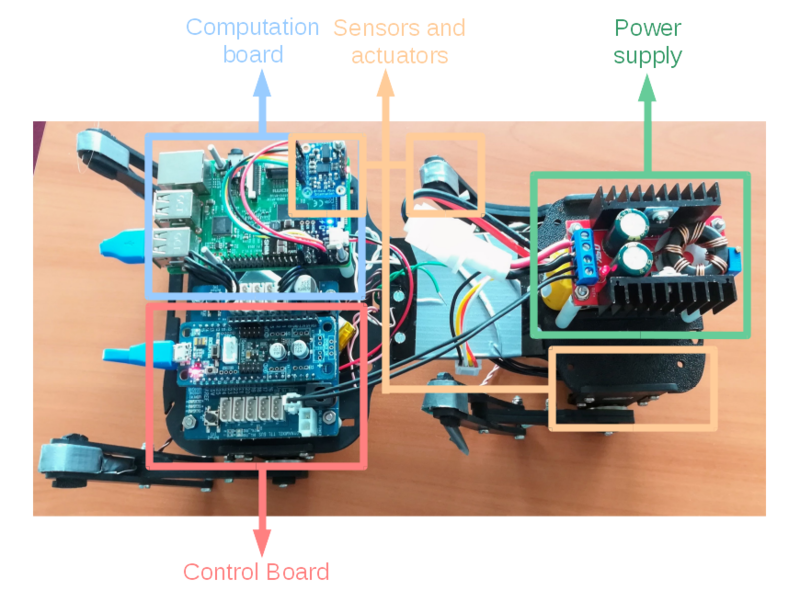 Details on the design, the electronics and the software architecture of the Tigrillo robot. The Tigrillo robot enables step 2 by providing a robot to validate the accuracy an general behavior in the NRP simulations. The design process of Tigrillo platform have been guided considering three main features for the robot: compliance, cheapness, versatility. The compliance is a key element in this research as it is believed to add efficiency and robustness to locomotion, like what we can see in biology. However, it also challenges classical control techniques as the dynamics of the robot is now governed by equations with a higher complexity level. On the current platform, the compliance is mainly ensure by using springs in the legs knee instead of actuating them. A short view of the mechanical porperties of the robot legs. A top view of the Tigrillo robot with details about the electronics architecture. The software repository also includes board documentation on the top of the python code used for control and simulation.